3,475 sq ft; lot: 0.23 acres - MLS# 2998161 Courtesy of Ashland Homes Real Estate Inc. 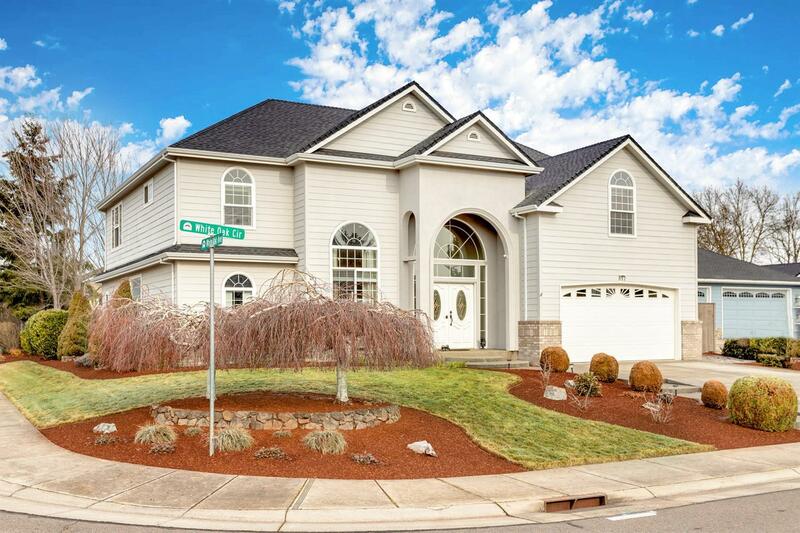 Spacious home with a stately presence, set on a corner lot in the White Oak Estates of Central Point, Oregon. Beautifully landscaped front yard and side yards enhance the curb appeal. Once inside you are met by soaring ceilings, a flowing staircase and an abundance of natural light filtering in from the many windows and skylights. Step down living room w/ gas fireplace and French doors lead to the large backyard. Well laid out kitchen with granite counters, lots of cabinetry and stainless-steel appliances overlook the dining and living room areas. Main level master bedroom suite has bathroom w/ double vanities, jetted tub and walk in closet. Upstairs you will find two bedrooms, full bathroom and a large versatile room that could be used for whatever your lifestyle desires, including, as the 4th bedroom. Private backyard is ready for entertaining, stamped concrete patios, gardens, lawns, an assortment of gorgeous trees, walkways and a soothing water feature. Welcome Home! Directions: I-5 Exit 33, E. Pine Street, left on Hamrick Rd, right on Beebe Rd., Left on White Oak Ave, right on White Oak Circle.